What makes a concert enjoyable and what is classed as the ultimate fan experience for concert goers? She woke up like this. She slays. She gets all the [single] ladies [who run the world], in formation. She is without a doubt one of the best-selling and most popular female pop vocalists of our time. She is Queen B, and she put down an absolutely phenomenal concert experience. In fact, if ever there were any negative points raised in a concert review, none of them appeared in the concert that Beyoncé delivered. But what are the elements that make or break a show? What do people expect when they pay a substantial amount of money to attend a concert? The latter question is an easy one to answer: the unique experience you share with other, likeminded fans through hearing your favourite artist perform the songs you’ve come to know and love. In the case of Beyoncé, discovering she actually is a spectacular live vocalist as well certainly adds to the experience. 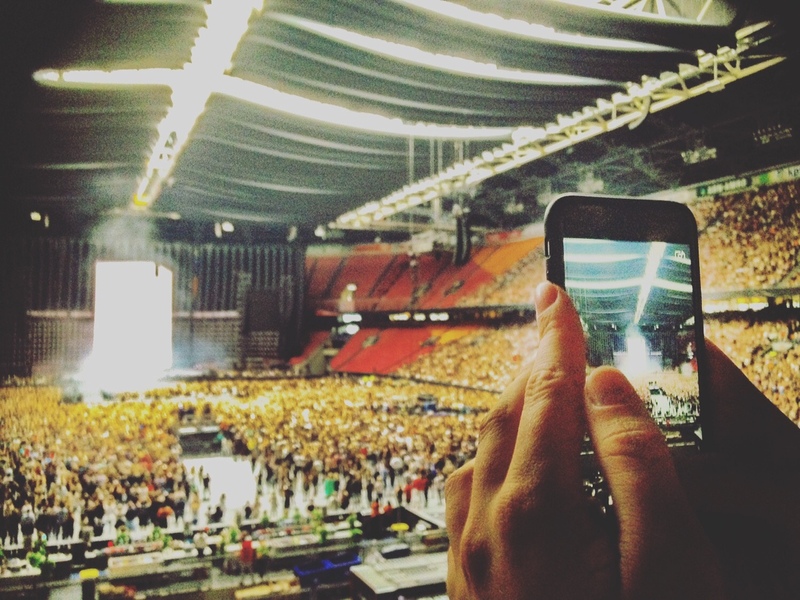 Two important factors can have an impact on your concert experience: the somewhat pre-determined (venue, facilities, queues) and the variable: other concert-goers. Reviewers commented on one of the pre-determined factors at Beyoncé in the ArenA: the sound and acoustics were not perfect. On the one hand, the size of the venue may affect the sound; on the other hand, more fans have the opportunity to see their favourite artist. This begs the question: what is the right size for a concert venue? And in what other ways can concert venues contribute to fan experience? Let’s take a step back and consider what happens before fans enter the concert venue. Most people arrive a few hours in advance, especially when they have non-seated tickets and want to get as close to the stage as possible. When the venue opens, tickets will be scanned and people are likely to go through a bag search. At Movement Strategies, we analyse queuing times and throughput capabilities of this process, in order to ensure that no one is queuing for an unacceptable time. This target time is variable and depends on the structure of the venue, the expected arrival times of the spectators, and numerous other factors. Once you have arrived inside the concert hall, people are likely to be using one or multiple facilities, such as the toilets, food stalls and drink stalls. Depending on the assumptions made, Movement Strategies analyse processing times at food and beverage stalls to ensure there are enough facilities to serve everyone, without queuing for too long. However, there is only so much anyone can plan for. The major variable factor at any concert are people and the way they behave. To a certain extent, we can make assumptions about a crowd’s behaviour depending on the performing artist and music style: heavy metal usually attracts a different crowd compared to a pop artist. Or, as someone once pondered on Twitter: “How do you act at an Adele concert? Is it just a bunch of people standing in a crowd all singing trying to hit the high notes with tears streaming down their face, sending texts to their exes? I don’t understand. What do you do at an Adele concert”? In any case, Adele has made it very clear what you should not be doing to enjoy her concert, as she allegedly told a fan to stop filming: “this isn’t a DVD, this is a real show”. I am sad to admit that I do belong to the group of people who take some photos of concerts (but of course, this is for marketing purposes only…) However, imagine this: you’re at a concert. You’re of average height (which does not help in a country like The Netherlands). And despite tippy-toeing efforts, you are still unable to see your favourite artists because these days, your fellow concert-goers prioritise bombarding their Instagram feed over actually enjoying a concert. It is this type of behaviour by your fellow concert-goers that can be irritating, even though most of us do not realise that what we do at a concert can influence other people’s experience of the concert. Having said that, plenty of concert venues have seating options that can offer you a better view and a less crowded experience. At Beyoncé, a wide spectrum of comfort levels was present: the crowd is standing closer together nearer to the stage (see photo) and further apart at the back of the podium level. The presence of other people can also make your concert experience more enjoyable. Look for example at crowds attending a music festival: if you have the sudden urge to start a mosh pit, undoubtedly you will be able to find like-minded people who enjoy expressing their adrenaline rush in a somewhat violent fashion. When people around you are having an amazing time at a concert, their exuberance can certainly improve your own concert experience – much more so than when the audience and performer do not seem to connect. At Beyoncé’s concert in the ArenA, both standing and seated tickets were available to accommodate all types of concert goers. Even though the concert capacity of the ArenA is over 50,000 people, the concert itself was almost intimate at times and more like a dance party at other times, depending on the song Beyoncé was singing. Even though some reviewers complained about the acoustics in the ArenA, the crowd seemed to have a fantastic experience. Additional bars on the podium level served those with standing tickets, and people were served within minutes.